Samuel Waxman Cancer Research Foundation (SWCRF) 20th anniversary of the Collaborating for a Cure Benefit Dinner & Auction @ Cipriani Wall Street. Cocktails 6:30 pm, Dinner 8:00 pm, Live Auction 9:15, Concert 9:45. The event will honor the memory of William S. Gorin, former Chief Executive Officer of MFA Financial, Inc., and a longtime SWCRF supporter who passed away in August after a courageous battle with pancreatic cancer. 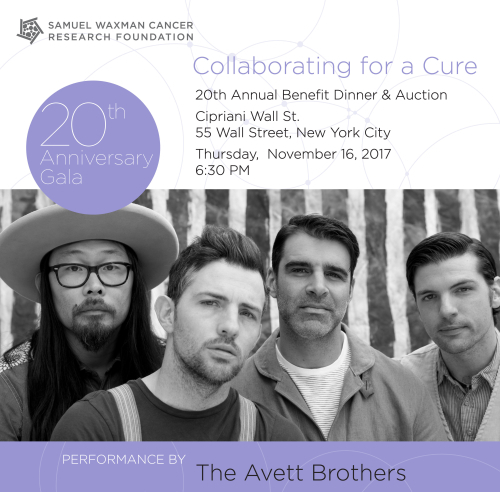 The Collaborating for a Cure Gala will be hosted by Chris Wragge, co-anchor of CBS 2 News This Morning, as master of ceremonies and will feature a musical performance by The Avett Brothers. Like SWCRF on Facebook and follow on Twitter & Instagram: @WaxmanCancer.